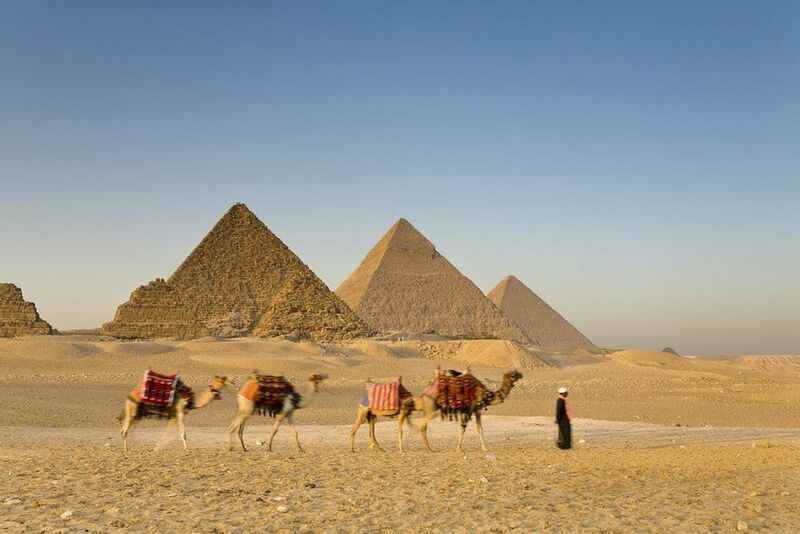 The Pyramids of Giza represent one of the greatest architectural feats by man. The last surviving member of the Seven Wonders of the World, the Great Pyramid of Giza is one of the world's oldest tourist attractions and the reason most people visit Egypt today. There are in fact three main pyramids in Giza; the Great Pyramid of Khufu (or Cheops), The Pyramid of Kafhre and the smaller Pyramid of Menkaura. Each Pyramid is a tomb to a different King of Egypt. In front of the pyramids lies the Sphinx, or Abu al-Hol in Arabic, "Father of Terror". Carved out of a single block of stone, this enormous cat-like sculpture has mesmerized millions of visitors. More than 16 million people call Cairo home and it's chaotic, exotic, smelly, dusty and also beautiful. Perhaps the most interesting section of Cairo is Medieval (Islamic) Cairo. Medieval Cairo is a warren of streets just bustling with life. There are mosques at every corner, Coptic churches, huge medieval gates and bazaars selling everything from motorbike parts to perfumes. Highlights include the Citadel and the Khan Al-Khalili bazaar (for all your tourist trinkets). The major mosques worth visiting include the Mosque of Mohammed Ali; the Ibn Tulun, one of the largest mosques in the world; and the Al-Azharmosque which houses the oldest university in the world (from 970AD). The New York Times has a nice article describing Medieval Cairo in all its glory (and squalor). Next, to the Pyramids of Giza, Abu Simbel is perhaps the most recognized monument of ancient Egypt. The two temples built for the pharaoh Ramesses II have been attracting visitors since Victorian times. Almost as impressive as the monument itself is the story of its restoration in the 1960's. The temples had to be dismantled and physically moved 60 meters up a cliff where they were reassembled in the exact same relation to each other and the sun. A daily sound and light show is a highlight not to be missed. If you can make it you should also see the Abu Simbel Festival which takes place twice a year in February and October. Natural sunlight and architectural brilliance combine to make the inner sanctum of the temple light up. It's a breathtaking sight and makes the music, dance, and food that accompanies the festival pale in comparison. Abu Simbel lies near the Egyptian border with Sudan. The closest major town is Aswan. You can get to Abu Simbel by plane from either Cairo or Aswan. There are also daily buses and tours from Aswan to Abu Simbel. Perhaps the best way to visit Abu Simbel is by boat. There are plenty of cruises starting in Aswan that range from 3 - 5 days. The spectacular Temples of Karnak are not to be missed when you travel to Egypt. As Michael Wood of the BBC History channel puts it: "Karnak is like a theme park of ancient Egyptian religion - in which every god and goddess of that civilization was represented over a period of about 2,000 years". It is no wonder then that Karnak was the most important place of worship in ancient Egypt. The site is huge, measuring 1500 x 800 meters, and is a spectacular complex of sanctuaries, kiosks, pylons and obelisks, all dedicated to the Theban gods. If you don't have the energy to cover all that ground then don't miss the Hypostyle Hall in the Great Temple of Amun. There are several performances of the sound and light show a night with mixed reviews, but mostly good. The Valley of the Kings (Biban El Moluk) situated on the ancient site of Thebes is where the pharaohs were buried and hoped to meet their Gods in the afterlife. This is where you will find Tutankhamun's tomb which was discovered almost intact in the 1920's. You can go inside the tomb, but you'll have to visit the Egyptian Museum in Cairo to see the treasures he was buried with. Tutankhamun was actually quite a minor king in the scheme of things and there are much larger and more impressive tombs to discover in the Valley of the Kings. The Siwa Oasis is situated in the Western Desert close to the Libyan border. It is Egypt's most remote oasis town and the Siwans have developed their own distinct Berber culture. Siwans speak their own language and their jewelry and crafts are exquisite. A decent road and a small airport have certainly put the Siwa Oasis on the tourist map but it is still off the beaten track. As well as its unique culture, the Siwa oasis is known for its geographical beauty, hot springs and the fact that Alexander the Great traveled here to visit the Oracle of Amun. It's a wonderful place to relax, swim and eat some olives. The old town of Siwa dates back to the 13th century and its mud and brick architecture looks gnarled and quite unique. See the Siwans own web site for more information on how to get there, where to stay and what to do. If you're an amateur snorkeler or a professional diver you will love Hurghada on the Red Sea. One of Egypt's top destinations for those looking to simply relax on the beach or enjoy some of the world's clearest waters and spectacular coral reefs. Hurghada offers more than 10 miles of beach and plenty of accommodation, restaurants, and nightclubs for all budgets. Diving is the most popular attraction here and there are numerous diving centers and schools around town. You can expect to see hundreds of spectacular fish both along the shore and around the nearby islands. For a dash of color, there's​ the blue-spotted stingray, lionfish, Hurghada Star and the Spanish Dancer Nudibranch. For those divers looking for bigger thrills, you can also see whale sharks, hammerhead sharks, and dolphins. If you get bored on the beach you can always head inland for a camel ride with the Bedouins. The Egyptian Museum in Cairo is one of the first stops on most people's itineraries when traveling to Egypt. With over 120,000 artifacts, the museum houses an incredible display depicting ancient Egypt's glorious reign. You can enjoy mummies, sarcophagi, pottery, jewelry and of course King Tutankhamen's treasures. King Tut's goodies include his socks, underwear and the boy-king's death-mask made of solid gold, described as the most beautiful object ever made. The displays are not all labeled very well and it's a little haphazard but you'll enjoy it nevertheless. For more information on exhibits and virtual tours visit the Egyptian museum web site For more information about visiting Cairo see my travel guide to Cairo. Note: If you can't make it all the way to Cairo but you're interested in seeing some of Tutankhamun's treasures, an exhibit is currently on display at the Pacific Science Center in Seattle: "Tutankhamun and the Golden Age of the Pharaohs".